The Galaxy NX from Samsung is now available in the U.S. starting at $1599 (for the body only), and can be had for $1699 which includes an 18-55mm lens. For an Android-powered camera, most of you may suffer from immediate sticker shock, but the camera is no slouch. For those unfamiliar, the Galaxy NX offers a 20.3MP APS-C sensor along with a DRIMe IV Image Signal Processor to deliver the “speed and accuracy which today’s photographers demand.” It also features an Advanced Hybrid Auto Focus system, a 1/6000 sec shutter speed and 8.6fps shooting, and a selection of interchangeable lenses from compact pancake to ultra-wide fisheye to longer prime and zoom lenses. Samsung’s investment into the lens selection for this camera should be highly noted, and is a major plus for any potential buyers. In terms of the OS, it is running Android 4.2, Jelly Bean – not the latest and greatest, but you can bet that Samsung went into the system to optimize its performance. The device features a 4.8″ HD LCD display, a 1.6GHz quad-core processor, 2GB of RAM, a 4360mAh battery, and has complete access to the Google Play store. So, to sum it up, it’s an ultra beefed up Galaxy Camera. Are you interested? How do you think this would stack up against players like Sony, Canon, and Nikon? We will have to wait for some reviews to hit the Web before we start judging. Samsung announces U.S. in-store availability for the GALAXY NX SMART Camera, the world’s first fully-connected Compact System Camera (CSC). The announcement marks the first shipments of the camera available to U.S. consumers. 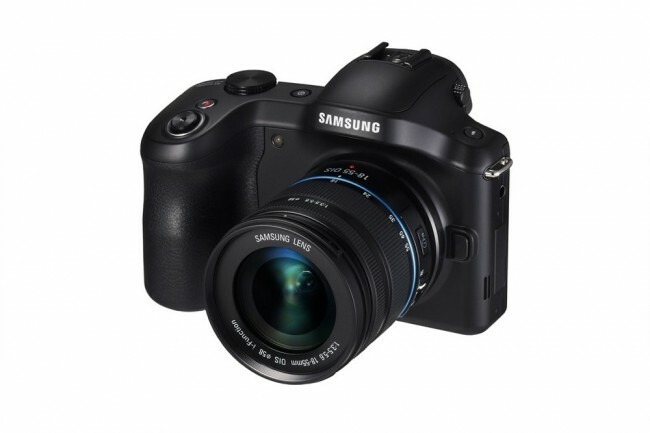 Powered by the Android 4.2 Jelly Bean operating system, the GALAXY NX offers a professional-level photographic experience with the simplicity and familiarity of a smartphone. Users can choose from a variety of Android apps to help personalize their GALAXY NX and do more than just shoot amazing photographs and video – from editing images to adding special effects to staying in touch with friends and family over email and messaging apps. The GALAXY NX’s 20.3MP APS-C Sensor produces images that are bright and detailed, even in low light conditions, while the DRIMe IV Image Signal Processor delivers the speed and accuracy today’s photographers demand. Its Advanced Hybrid Auto Focus (AF) System ensures accurate phase and contrast detection for crisp, vibrant shots, while the 1/6000 sec shutter speed and 8.6fps shooting lets users capture fast-moving action as it happens. From recording family milestones to snapping the photo-finish as racers cross the line, the GALAXY NX confidently tackles any photo assignment. Photographers will appreciate the expanded workflow options afforded by the GALAXY NX, with in-camera features that let them instantly watermark images, apply post-capture editing features and even email photos directly from the studio or while out in the field. Additionally, the GALAXY NX allows users to wirelessly mirror their camera’s interface to high-resolution monitors for real-time viewing of images and photo-capture. The GALAXY NX is compatible with all of Samsung’s NX-series lenses, including the new 10mm fisheye lens and the highly-acclaimed 85mm lens. This flexibility places creative control in the hands of the photographer and opens up a world of possibilities for a variety of shooters. Beyond the integrated Android 4.2 Jellybean interface, the GALAXY NX is teeming with shooting and editing options, including more than 30 Smart Modes for easily capturing stunning images in a variety of scenarios. Moreover, the GALAXY NX employs a new Camera Studio widget, which consolidates custom settings and places them in an easy-to-navigate viewing pane for quick access. The GALAXY NX is available at Samsung authorized resellers beginning today for $1,599.99 (body only) and $1,699.99 (including an 18-55mm lens). For more information, please visit www.samsung.com.